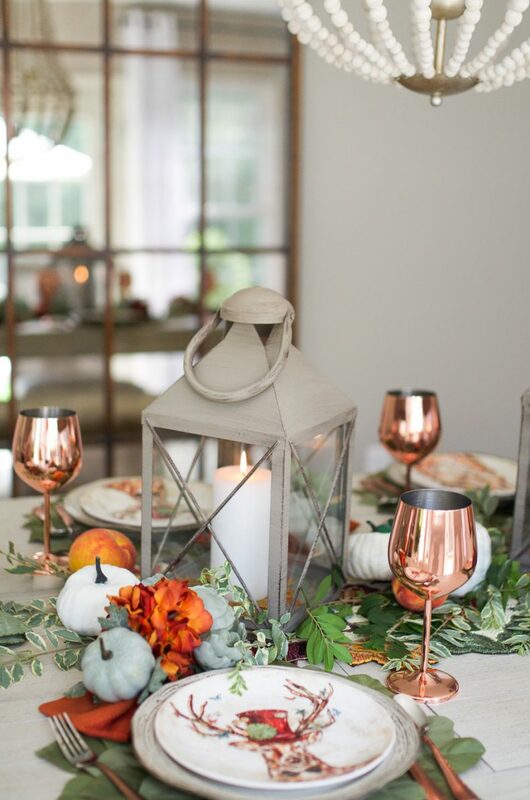 Learn how to set a beautiful autumn table that is sure to please everyone on your guest list this fall with these easy to implement autumn table tips! 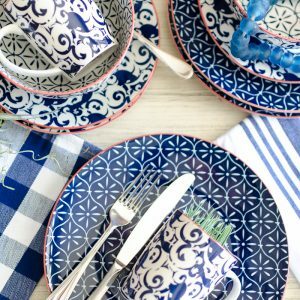 This post is sponsored by Pier 1 and contains affiliate links. All thoughts, words, pictures, and ideas are my own. 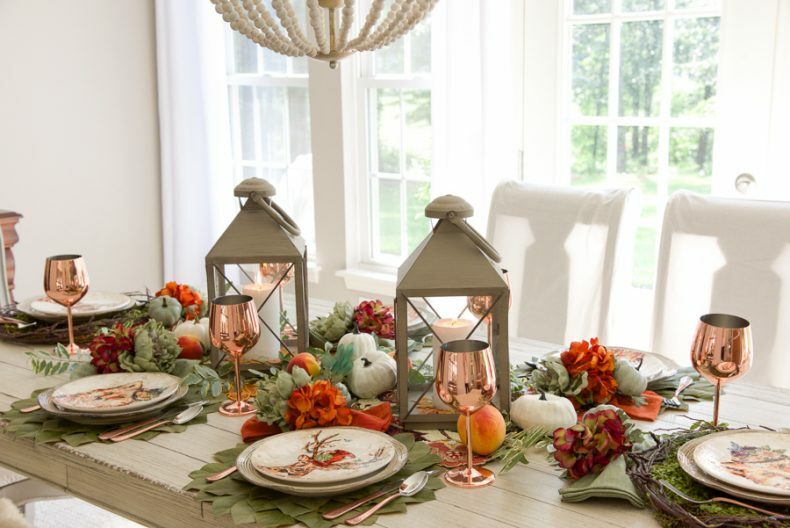 Fall entertaining is right around the corner and you want to create a beautiful, yet simple tablescape. I’m here to help! 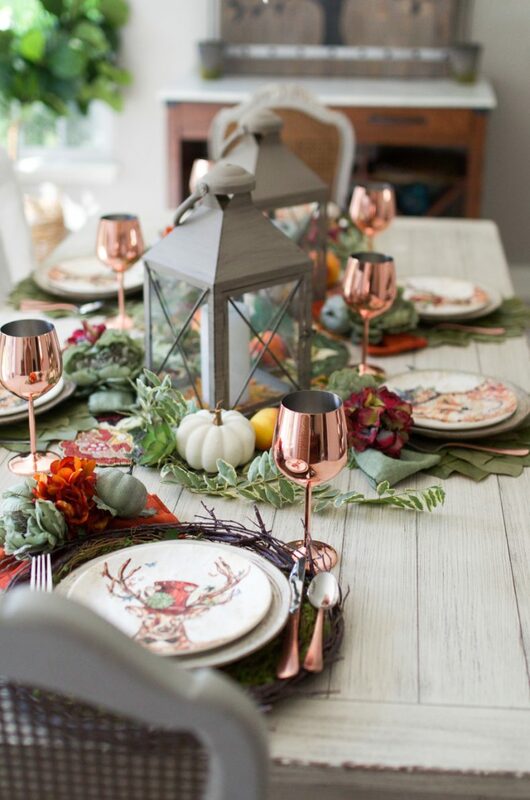 Creating a stunning autumn table for your guests is easy to accomplish using items from Pier 1 and these expert table setting tips. 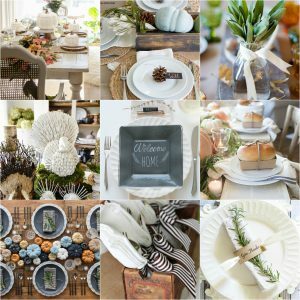 Feel free to steal these ideas and create your own memorable fall table that both you and your guests will love! 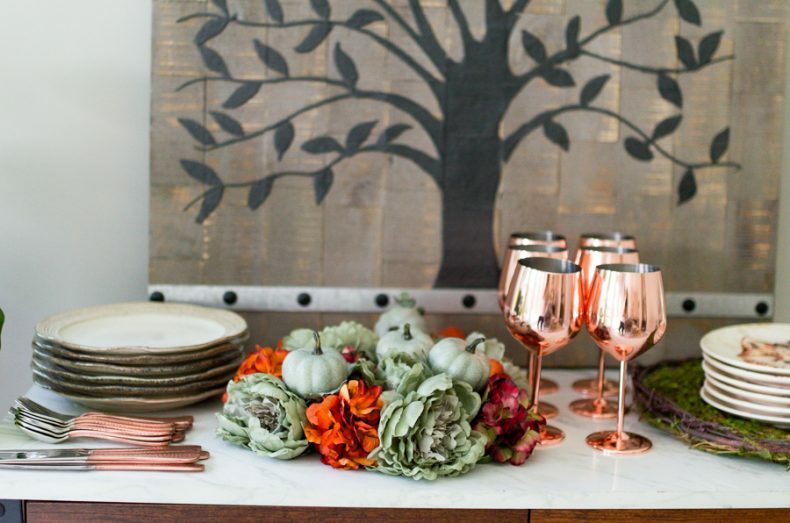 Autumn Table Tips 1: Choose your color palette. 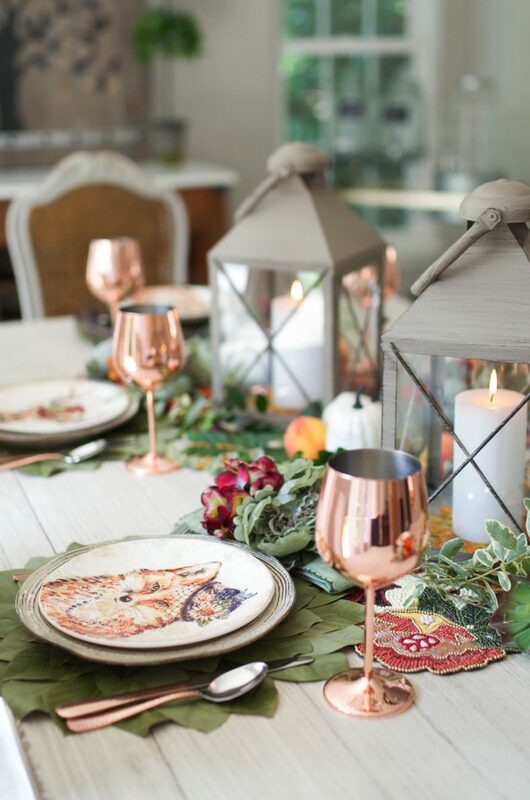 Use a decorative plate, serveware piece, tablecloth, or runner as inspiration for your table color palette. Often the most difficult decision when beginning a design plan is choosing the color palette. Try picking one or two items for your table that inspire the rest of your design. 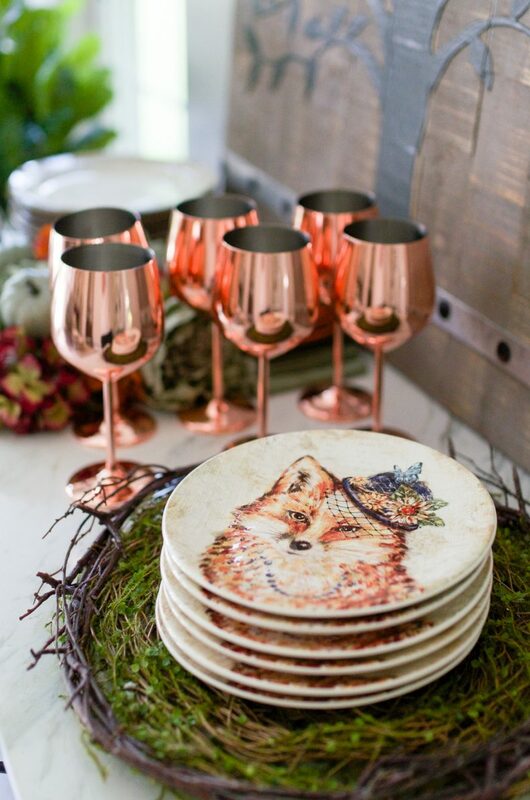 For example, I first chose the Regal Fox Lady and the Regal Deer Salad Plates and then–with plates in hand–I walked around the store gathering tableware that complemented my inspiration objects. 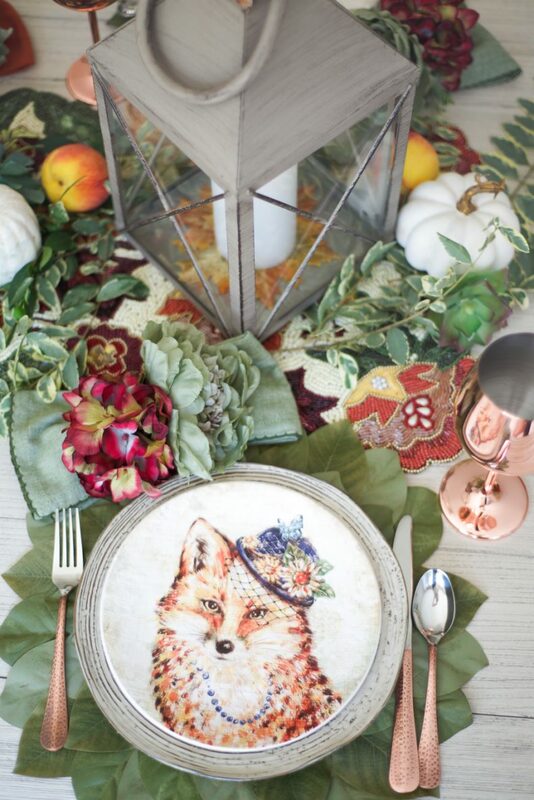 The zany and fun plates set the stage for my whimsical woodland theme in traditional fall colors. 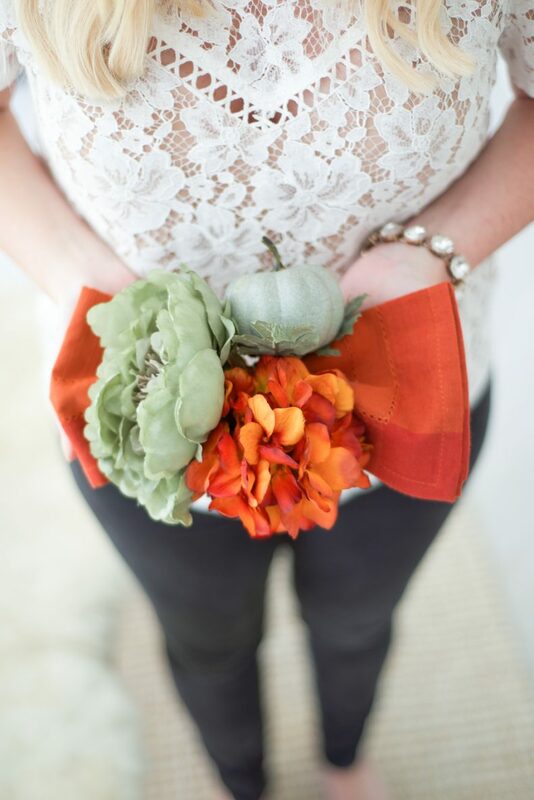 Autumn Table Tips 2: Pick your table runner and centerpiece. 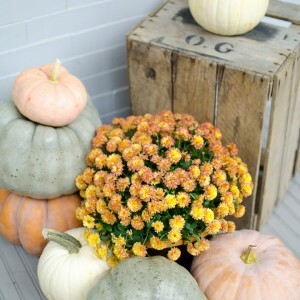 Add a centerpiece with bountiful color and texture for fall. 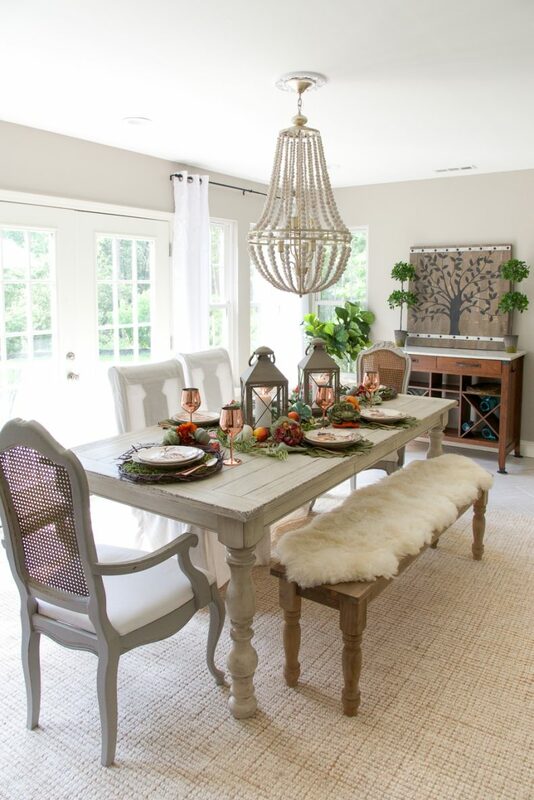 I love our rustic farmhouse table and tend to forgo a tablecloth in favor of a less formal table runner. 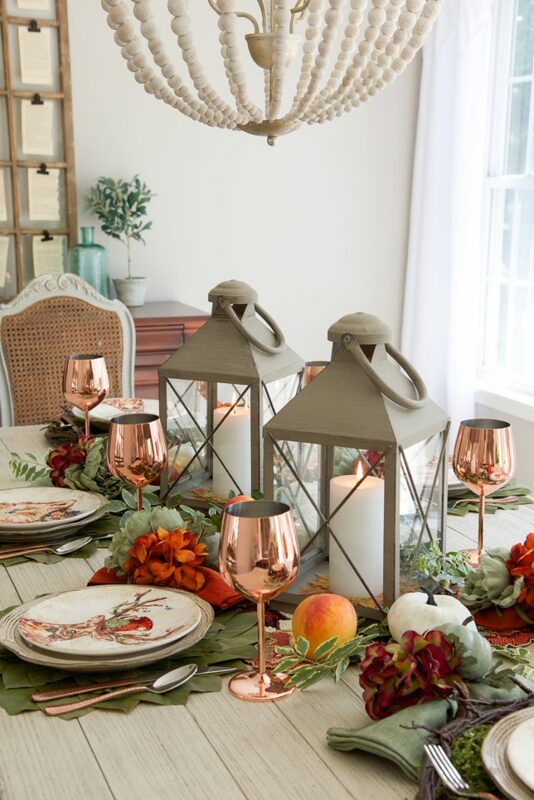 For my centerpiece, I used the gorgeous Autumn Field of Wildflowers Beaded Table Runner and added two medium Bennett Gray Metal Lanterns to the table. Inside each lantern, I placed a cute faux maple leaf coaster beneath each candle. Design is in the details and I love the pop of color this adds to the lanterns. 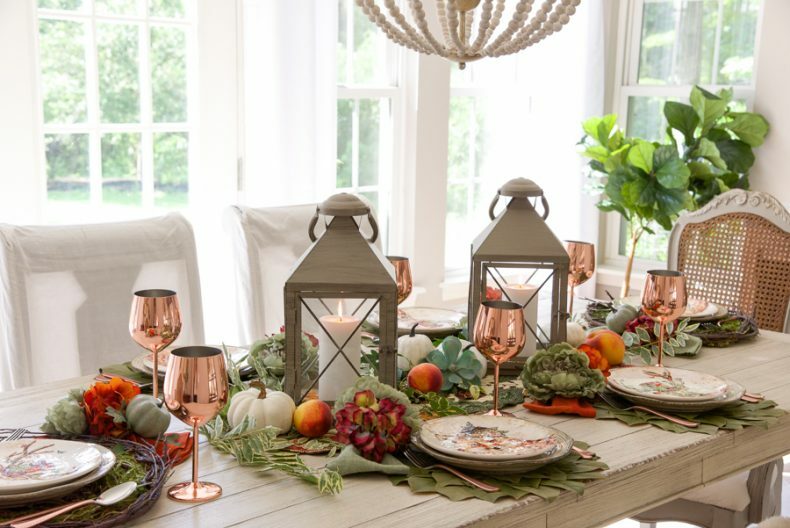 Next, I scattered peaches from my refrigerator, faux white pumpkins from my fall stash, and a few leafy branch clippings from the yard to add life to my centerpiece! 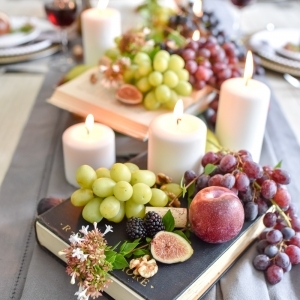 Don’t be afraid to curate your centerpiece by using a mix of newly purchased items with things from around your home. Autumn Table Tips 3: Mix and match your placemats. Mix up your placemats to add texture and interest to your table. In keeping with my whimsical woodland theme, I used two different leaf placemats in complementary shades of green. 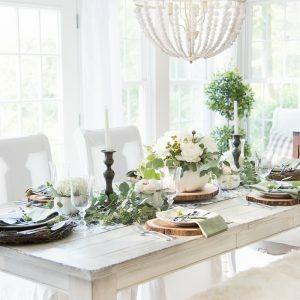 Using various shades of green is a fantastic way to add texture to your table without complicating the look with additional color. 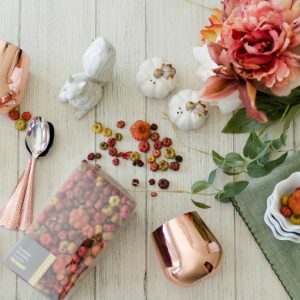 Autumn Table Tips 4: Don’t forget the glitz and bling! 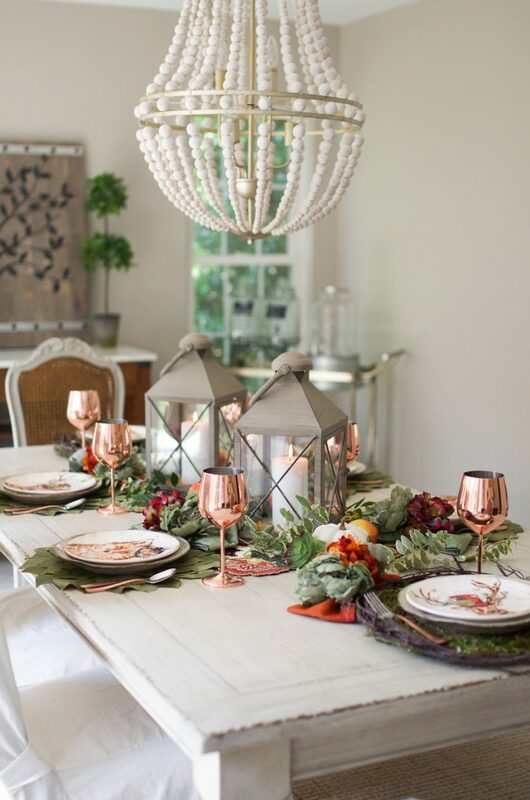 Add warmth and glamour to your table with metallics. 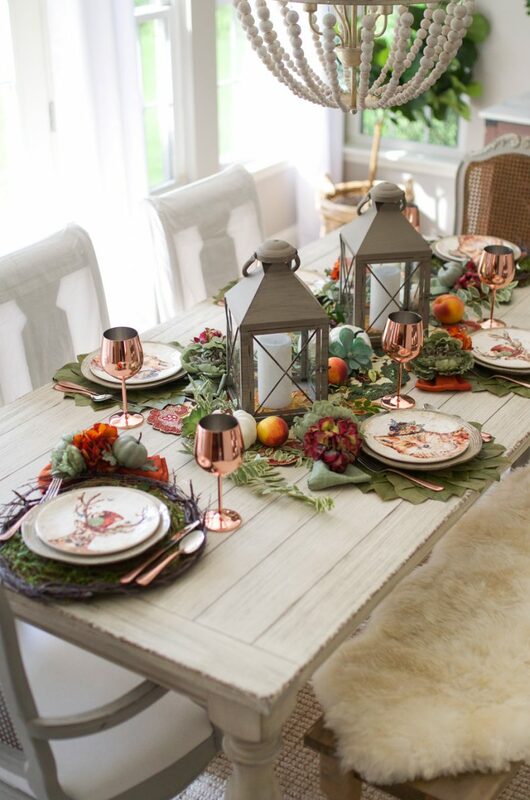 Copper, gold, and bronze pair beautifully with traditional fall colors and add warmth and modernity to your table. Choose flatware, glassware, and accent pieces in metallic shades to brighten up an otherwise traditional space. 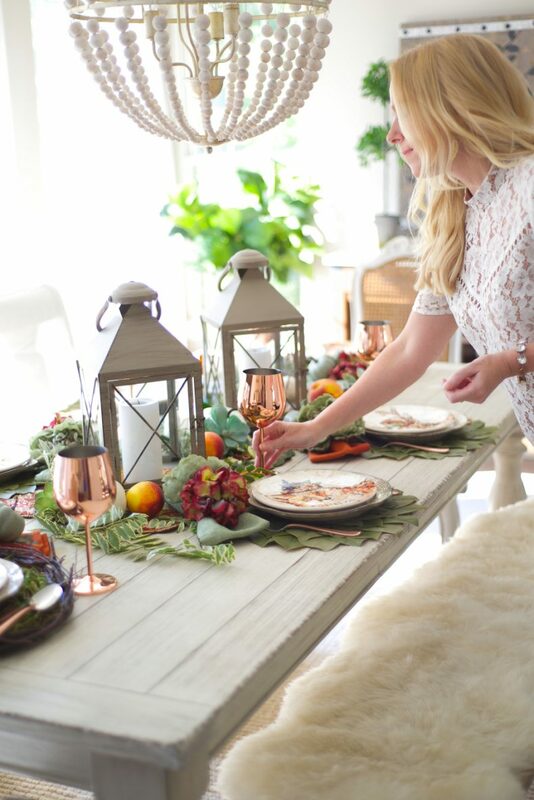 On my table, I used the copper Seraphina Flatware and the Copper Stainless Steel Wine Glasses to add a hint of glamour and sophistication. 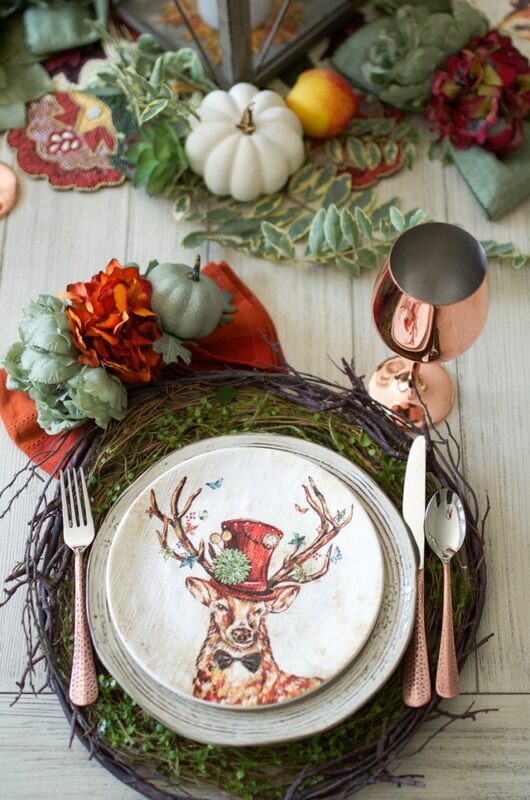 Autumn Table Tips 5: Personalize place settings with napkin rings. Get quirky and creative by using mix and match napkins and napkin rings. I love to personalize each place setting by making it slightly different than its neighbor. Taking cues from the floral-hat wearing fox and bowtie clad deer, I turned each napkin into a quirky floral bowtie. I used several napkin rings instead of just one, to create a lavish and unexpected bouquet at each place setting that doubles as a party favor. Allow guests to take home a napkin ring as a memento of the evening! 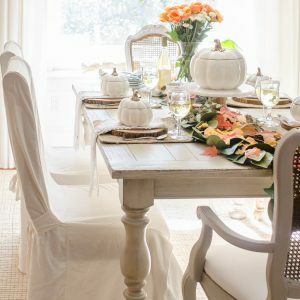 I hope these simple autumn table tips on how to set a table for fall inspire you to entertain this season! Looking for more helpful decorating tips this fall? 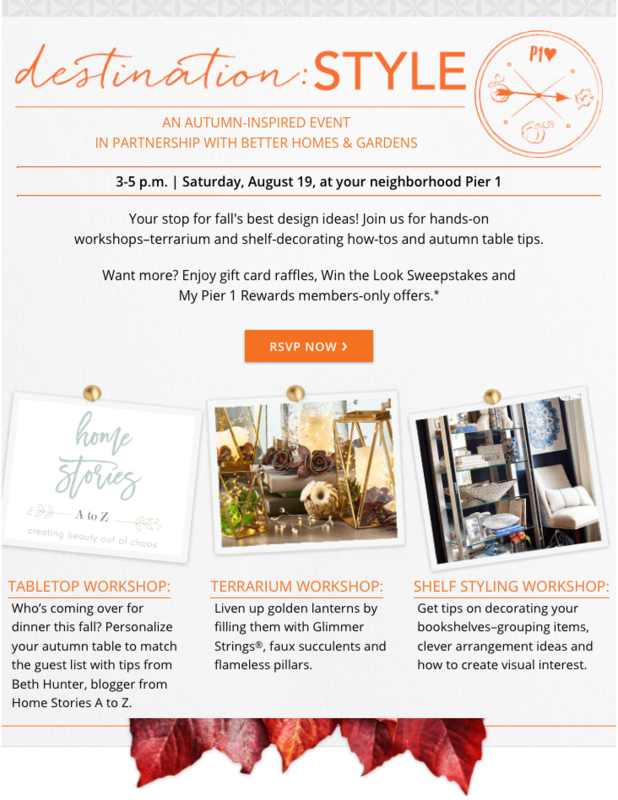 Then mark your calendars for a special autumn-inspired event at Pier 1 in partnership with Better Homes & Gardens! On Saturday, August 19, there will be hands-on workshops at your local Pier 1 where you will learn how to build a terrarium, decorate your shelves, and set the table for fall! RSVP at the link below. I work at Pier 1 and I absolutely love what you chose! The table looked amazing in person and the customers really liked it too. Love this table setting. In store demo was great. Thank you so much for sharing!! Thanks Dana! I’m glad to hear you liked it! Love, Love, LOVE those plates! !